For larger battles, planning typically consisted of a council of the war leaders, which could either be the commander laying down a plan or a debate between the different leaders, depending on how much authority the commander possessed. Often decisions were dictated by the Church and formulated for religious rather than military reasons. This explains for example some of the worst disasters suffered by crusaders armies during the Crusades where senior clergy in command of armies routinely ignored advice from seasoned commanders. Infantry, including missile troops, would typically be employed at the outset of the battle to break open infantry formations. Cavalry attempted to defeat the enemy cavalry. Once one side coaxed their opposing infantry into breaking formation, the cavalry would be deployed in attempt to exploit the loss of cohesion in the opposing infantry lines and begin slaying the infantrymen from horse top. Once a break in the lines was exploited, the cavalry became instrumental to victory - causing further breakage in the lines and wreaking havoc amongst the infantrymen, as it is much easier to kill a man from the top of a horse than to stand on the ground and face a half-ton destrier carrying an armed knight. Until a significant break in the enemy infantry lines arose, the cavalry could not be used to much effect against infantry since horses are not easily harried into a wall of pikemen. Pure infantry conflicts would be drawn-out affairs. A hasty retreat could cause greater casualties than an organized withdrawal, because the fast cavalry of the winning side's rearguard would intercept the fleeing enemy while their infantry continued their attack. 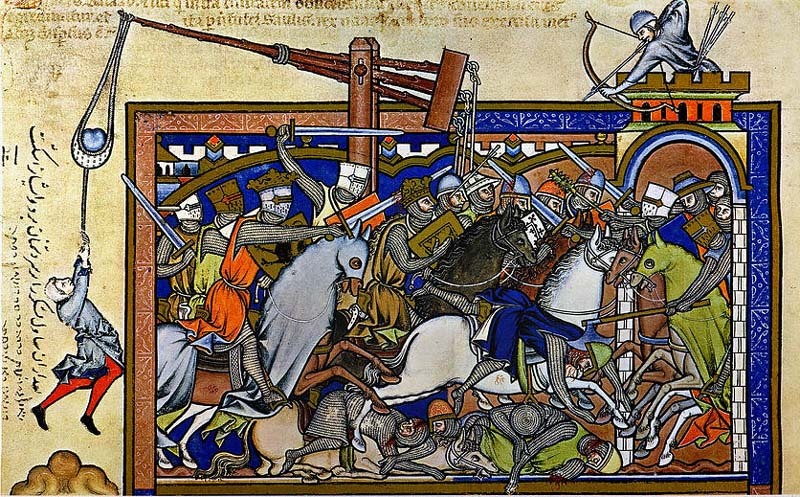 In most medieval battles, more soldiers were killed during the retreat than in battle, since mounted knights could quickly and easily dispatch the archers and infantry who were no longer protected by a line of pikes as they had been during the previous fighting. Breakdowns in centralized states led to the rise of a number of groups that turned to large-scale pillage as a source of income. Most notably the Vikings, Arabs, Mongols and Magyars raided significantly. As these groups were generally small and needed to move quickly, building fortifications was a good way to provide refuge and protection for the people and the wealth in the region. These fortifications evolved over the course of the Middle Ages, the most important form being the castle, a structure which has become synonymous with the Medieval era to many. The castle served as a protected place for the local elites. Inside a castle they were protected from bands of raiders and could send mounted warriors to drive the raiders from the area, or to disrupt the efforts of larger armies to supply themselves in the region by gaining local superiority over foraging parties that would be impossible against the whole enemy host. Fortifications provided safety to the lord, his family, his servants and his local vassals. They provided refuge from armies too large to face in open battle. Heavy cavalry which dominate an open battle was useless against fortifications. 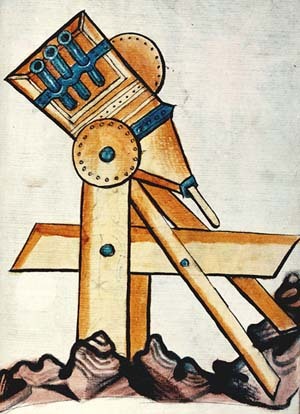 Building siege engines was a time-consuming process, and could seldom be effectively done without preparations before the campaign. Sieges could take months, or even years, to weaken or demoralize the defenders sufficiently. 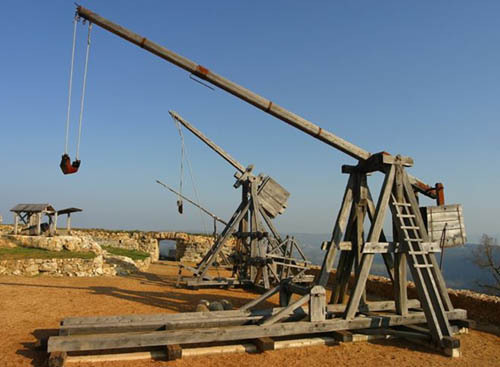 In the Medieval period besieging armies used a wide variety of siege engines including: scaling ladders; battering rams; siege towers and various types of catapults such as the mangonel, onager, ballista, and trebuchet. 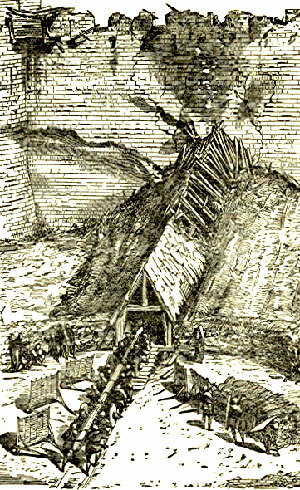 Siege techniques also included mining. Advances in the prosecution of sieges encouraged the development of a variety of defensive counter-measures. 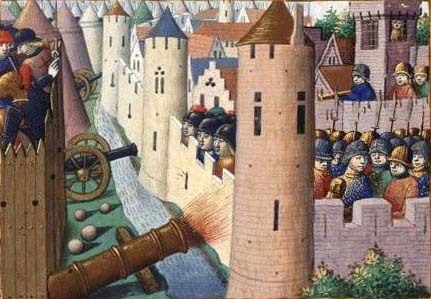 In particular, medieval fortifications became progressively stronger — for example, the advent of the concentric castle from the period of the Crusades — and more dangerous to attackers as witnessed by the increasing use of machicolations and murder-holes, as well the preparation of hot or incendiary substances. Arrow slits, concealed doors for sallies, and deep water wells were also integral to resisting siege. Designers of castles paid particular attention to defending entrances, protecting gates with drawbridges, portcullises and barbicans. Wet skins of freshly slaughtered animals were draped over gates, hourdes and other wooden structures to retard fire. 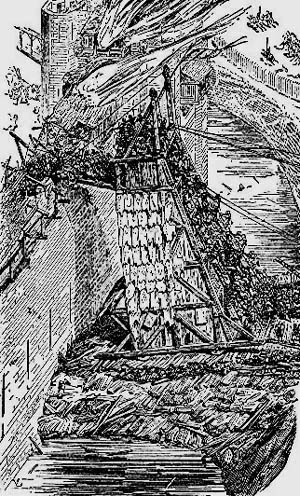 Moats and other water defences, whether natural or augmented, were also vital to defenders. In the European Middle Ages, virtually all large cities had city walls. Carcassonne and Dubrovnik in Dalmatia are well-preserved examples. The more important cities had citadels, forts or castles inside them, often built against the city walls. Great effort was expended to ensure a good water supply inside the city in case of siege. In some cases, long tunnels were constructed to carry water into the city. Complex systems of underground tunnels were used for storage and communications in medieval cities like Tábor in Bohemia. 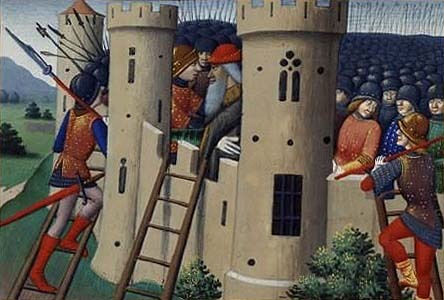 Attackers would try to get over the walls using scaling ladders, siege towers called belfries, and grapples. Alternatively they could try to get through the doors using a battering ram, or through the walls using heavy artillery. They might try tunnelling under the walls to gain access, but more often they would try to undermine the walls to bring them down. In a siege one army typically attacks an enemy within a stronghold. either a castle or a fortified town. Medieval towns were generally surrounded by defensive walls, just like castles. Indeed the distinction between castles and fortified towns is often blurred. Castles were often located within fortified towns - in fact many towns grew up around existing castles - so that the castle became a sort of citadel within the fortified town. Plan of Carcassonne - you can see the castle (chateau comtal) within the city walls. The odd external feature was a stairway down to the River Aude. 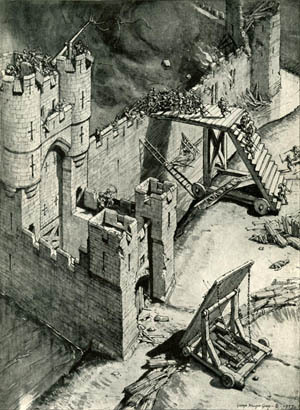 Attackers therefore often had two sets of obstacles - first the city walls, then the castle walls. This could lead to interesting complications as at Beaucaire in 1216. 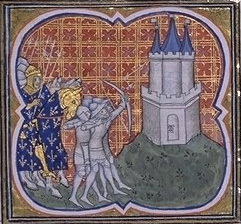 For months Simon de Montfort besieged Raymondet in the town, while Raymondet besieged a garrison loyal to de Montfort in the castle within the town. 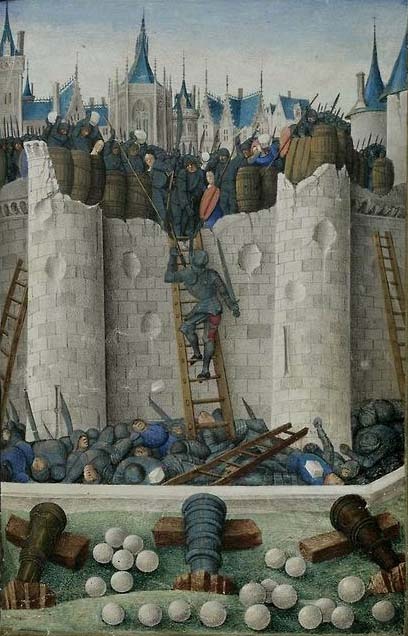 Sometimes there were three sets of obstacles, because fauxburgs with their own defensive walls were often built on to the exterior of city walls, as at Carcassonne and Termes. breaching the walls or doorways. Attackers would use weapons to get through walls. 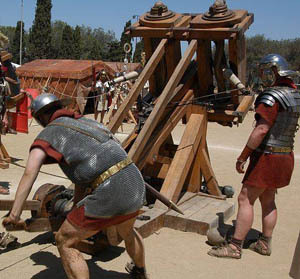 Examples are stone throwing machines petriers such as trebuchets and mangonels); machines to knock holes in walls such as battering rams; and engines to extract individual dressed stones one by one (cats, weasels and simple picks). tunelling under the walls. Attackers would build mines, either to gain access to the interior or to undermine and collapse the defensive walls. getting over the walls. 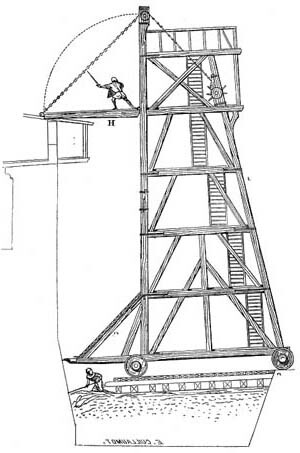 Attackers would use scaling ladders and siege engines such as large mobile wooden towers known as belfries. sitting and waiting. 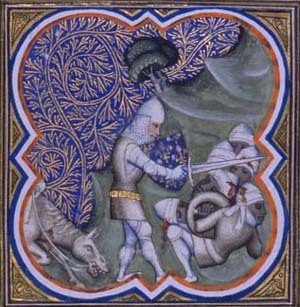 If communications between the besieged and the outside world could be cut then the defenders could be denied food supplies and sometimes water (as at Beaucaire, Carcassonne, Minerve, and Termes). This was not always possible (as for Raymondet at Beaucaire and at Montsegur). 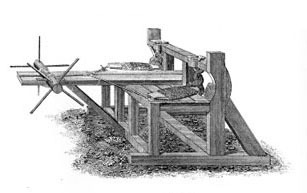 The word siege means "to sit", an indication that this was a standard technique. A Fifth Column. Inducing someone on the inside to assist the attackers, either by bribery or exploiting divided loyalties. They could for example open a postern gate at night. 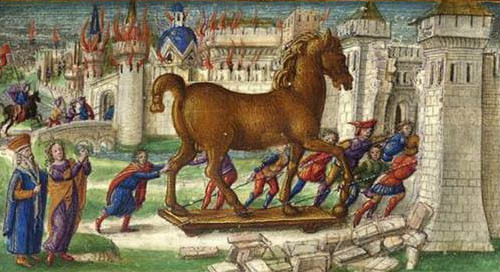 Occasionally attackers could be smuggled in to the besieged fortification to fulfil this role, as for example in ancient times in the famous Trojan horse. Diplomacy, threats, terror and psychological techniques. To help weaken the will of the defenders, attackers could make threats or promises, or terrorise the defenders - for example by mutilating or executing hostages, or by using throwing machines to lob fire, or human heads or other body parts, into the the fortification. Biological Warfare. Medieval besiegers were known to project diseased animals into fortifications with the deliberate intention of spreading disease and so weakening the garisson. I some cases it was possible to poison water supplies, though most fortifications had their own wells or water cisterns. 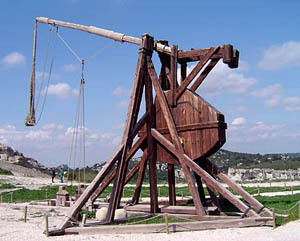 Until the invention of gunpowder-based weapons (and the resulting higher-velocity projectiles), the balance of power and logistics definitely favoured the defender. 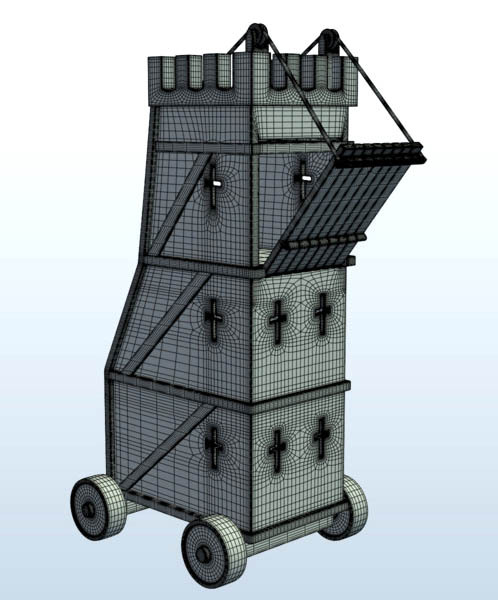 With the invention of gunpowder, the traditional methods of defence became less and less effective against a determined siege, giving rise to a new form of defensive structure, the star-fort. 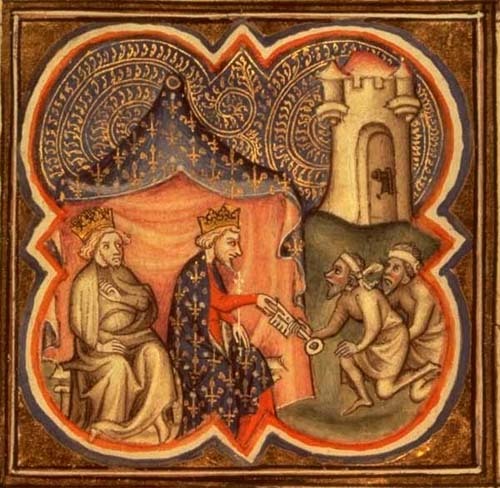 Philippe Augustus, King of France, recieves the keys of a surrendered city from two of the inhabitants. 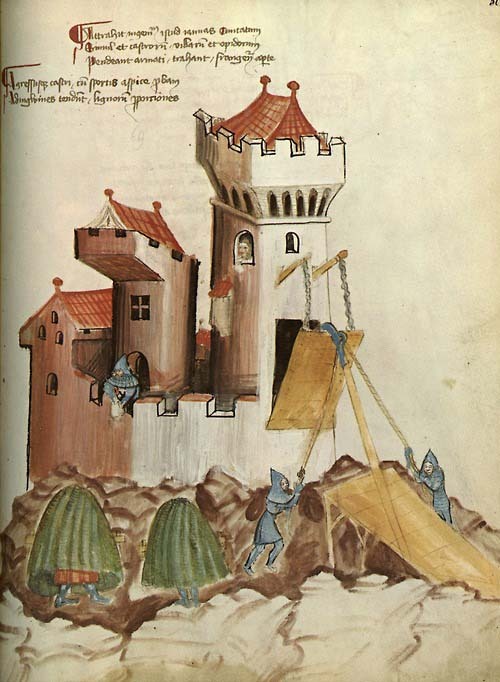 The medieval belfry was not a church tower, but a siege engine - the modern meaning seemsto have come about by the erroneous association of towers and bells (etymologically, the bel in belfry is not connected with the word "bell"). A belfry was used for gaining access to a castle, generally at the level of the battlements. 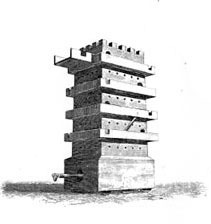 It was typically constructed in wood, on several stories - as many as necessary to reach the battlements. Each story offered a location for attack - bows and crossbows in the lower levels, and armed men in the upper level, ready to drop a sort of drawbridge and gain access to the castle ramparts. The belfry was normally wheeled, so that it could be moved up against the castle walls, and like all exposed wooden engines of war it would be covered in the hides of freshly slaughtered animals and regularly dowsed in water to keep it fireproof. 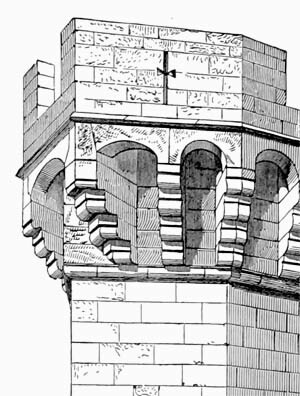 One way to foil the approach of a belfry was to have sloping castle walls. This forced the attackers to cover a greater distance from the top of the belfry to the top of the castle wall. This was one of the benefits of a talus. Another way to foil the approach was to build ditches and moats to prevent the approach of belfries. As on the right, attackers often needed to fill up the ditch or moat to provide a level surface that extended all the way to the foot of the castle wall. In practice, all sorts of material was used for this: earth, rocks, straw, dead bodies, wood, whatever came to hand. If too much wood was used in the infill then the infill itself became a target for fire setters. 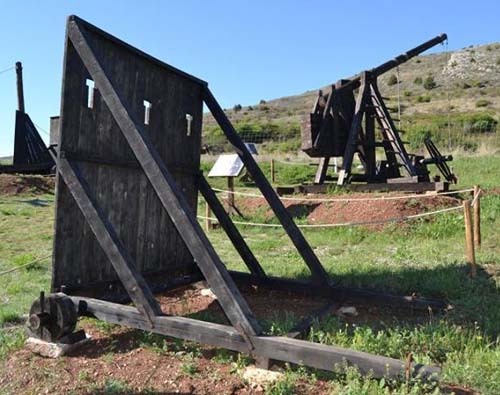 A battering ram is a siege engine originating in ancient times to breach fortification walls or doors. 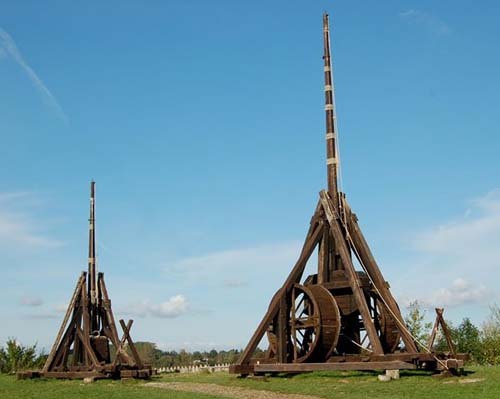 In its simplest form, a battering ram is just a large, heavy log carried by several people and propelled with force against the target, the momentum of the ram damaging the target. In a more sophisticated design, the ram was slung from a wheeled support frame so that it could be much more massive and also more easily swung against its target. Sometimes the ram's attacking point would be reinforced with a metal head. A capped ram is a battering ram that has an accessory at the head (usually made of iron or steel, traditionally shaped into the head and horns of a ram to do more damage to a building. 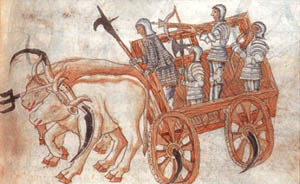 Many battering rams had protective roofs and side-screens covered in materials, often fresh wet hides to prevent the ram being set on fire, as well as to protect the ram's operators of the ram from enemies firing arrows down on them. An image of an Assyrian battering ram shows how sophisticated attack and defence had come by the 9th century BC. In the image defenders are trying to set the ram alight with torches and have also put a chain under the ram. The attackers are trying to pull on the chain to free the ram - the same scene could have been depicted in Roman, Visigothic or Medieval times. When a castle was being attacked, defenders attempted to foil battering rams by dropping obstacles in front of the ram just before it hit a wall, using grappling hooks to immobilize the log, setting the ram on fire, or sallying out to attack the ram. 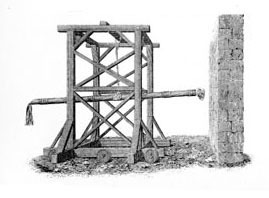 Battering rams had an important effect on the evolution of defensive walls - the talus for example was one way of reinforcing walls. In practice, wooden gates would generally offer the easiest targets. "... long, straight, sharp and shod with iron; it thrust, carved and smashed till the wall was breached and many of the dressed stones thrown down. When the besieged Crusaders saw that, they did not panic but made a rope lasso and used a device to fling it so that they caught and held the ram's head, to the rage of all in Beaucaire. Then the engineer who had set up the battering ram arrived. He and his men slipped secretly into the rock itself [presumably the hole already made by the ram, intending to break through the wall with their sharp picks. But when the men in the keep realised this, they cast down fire, sulphur and tow together in a piece of cloth and let it down on a chain. When the fire caught and the sulphur ran, the flames and stench so stupefied them that not one of them could stay there. Then they used their stone throwers and broke down the beams and palisades." (The Song of the Crusade, laisse 164). A Cat was a wooden structure built (or moved) up to a defensive wall. From surviving documents it seems that an arm could manipulated to claw away at the castle wall - hence the name. 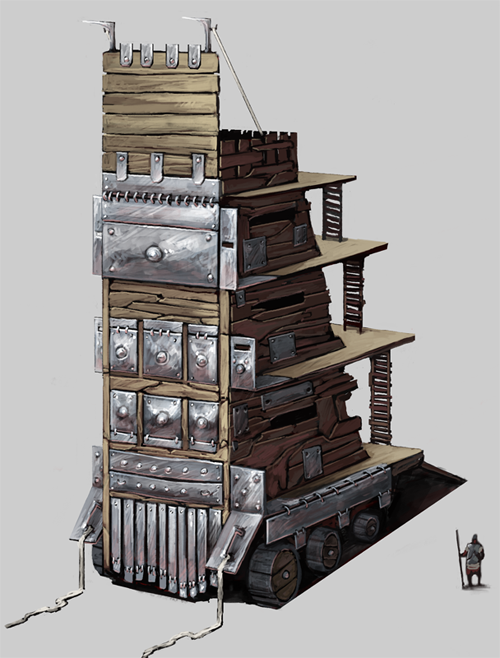 Cats could be large multi-purpose structures, perhaps with a trebuchet on top and sappers operating from the protected interior. Cats were much feared and if they possibly could, castle defenders would try to destroy them by mounting sorties, by using stone throwing engines, or by setting fire to them. 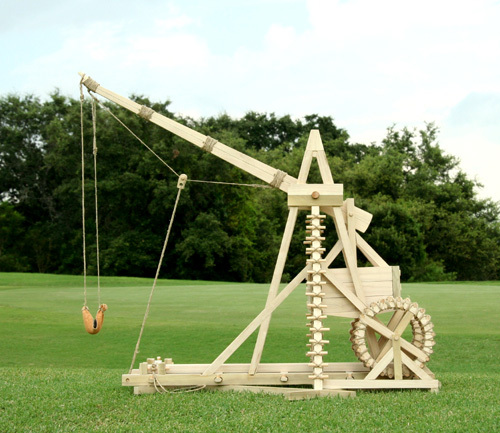 Like all wooden siege engines they would be routinely covered in the skins of freshly slaughtered animals and regularly dowsed with water to keep them fireproof. Simon de Montfort used a cat at the Siege of Beaucaire in 1216, but unsuccessfully. According to the Canso it had "no more effect than an enchanter's dream". It was "a spider's web and a sheer waste of material". Perhaps the most famous cat was one Simon built two years later, attempting to besiege the City of Toulouse in 1217-18. 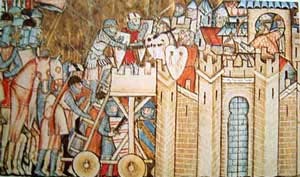 It was while protecting his cat from counter attack by the citizens of Toulouse that Simon de Montfort was struck on the head by a massive stone projectile from a trebuchet on the city walls, and killed instantly. A weasel was a similar sort of structure to a cat, but smaller and lighter. It seems to have been more manoeuvrable and used a spike rather than a paw to attack castle walls. It may have taken its name from its business end looking like a weasel's nose, or perhaps its long thin body, or both. A weasel was used by the forces of Raymondet, the future Count Raymond VII of Toulouse, at Beaucaire in 1216 according to the The Song of the Crusade (Canso de la crozada). As Simon de Montfort was conducting a Council of War, a beggar burst in, shouting that he had seen a weasel. The weasel was already against the citadel wall and ready to drive a spike into it. The defenders were quick to react. The chief engineer hurled a pot of molten pitch at it, hitting it in exactly the right spot and it burst into flames. Incendiary devices were standard weapons of war. Wooden defences always needed protection from burning. 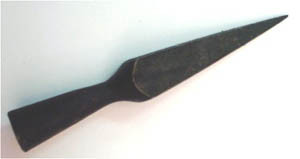 Wet animal hides were highly effective against burning arrows so military engineers dedicated themselves to finding ways of ensuring that fires burned as long and as strongly as necessary to catch. All sorts of chemicals could be used for this purpose - petroleum, sulphur, quicklime and tar barrels for example. Liquid fire is represented on Assyrian bas-reliefs. At the siege of Plataea in 429 BC the Spartans attempted to burn the town by piling up against the walls wood saturated with pitch and sulphur and setting it on fire, and at the siege of Delium in 424 BC a cauldron containing pitch, sulphur and burning charcoal was placed against the walls. A century later Aeneas Tacticus mentions a mixture of sulphur, pitch, charcoal, incense and tow packed in wooden vessels, ignited and thrown onto the decks of enemy ships. Formulae given by Vegetius around AD 350 add naphtha or petroleum. Some nine centuries later the same substances are found and later recipes include saltpetre and turpentine make their appearance. The ultimate in this form of chemical warfare was called Greek-Fire. Greek fire was a burning-liquid used as a weapon of war by the Byzantines, and also by Arabs, Chinese, and Mongols. Incendiary weapons had been in use for centuries: petroleum and sulphur had both been in use since the early days of the Christianity. Greek fire was vastly more potent. 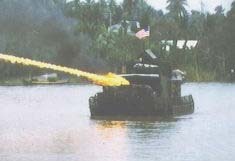 Similar to modern napalm, it would adhere to surfaces, ignite upon contact, and could not be extinguished by water alone. Byzantines used it in naval battles to great effect because it burned on water. It was responsible for numerous Byzantine military victories on land as well as at sea - and also for enemies preferring discretion to valour so that many battles never took place at all. It was the ultimate deterrent of the time, and helps explain the Byzantine Empire's survival until 1453. There was no defence. As the Lord of Joinville noted in the thirteenth century "Every time they hurl the fire at us, we go down on our elbows and knees, and beseech Our Lord to save us from this danger." Men were known to simply flee their posts rather than face Greek Fire. On the other hand Greek fire was very hard to control, and it would often accidentally set Byzantine ships ablaze. 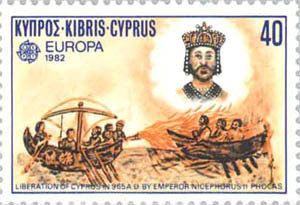 Greek Fire is said to have been invented by a Syrian Engineer, one Callinicus or Kallinikos, a refugee from Maalbek, or an architect from Heliopolis in the Byzantine Province of Judaea, in the seventh century (673 AD). The formula for Greek fire was a closely guarded secret and it remains a mystery to this day. The term Greek Fire was not attributed to it until the time of the European Crusades. Some of the original names include Liquid Fire, Marine Fire, Artificial Fire and Roman Fire. (Muslims against whom the weapon was used called the Byzantines Romans). 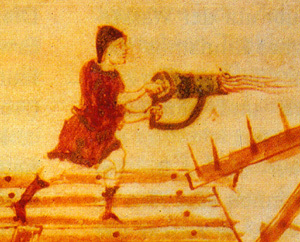 The weapon was first used by the Byzantine navy, and the most common method of deployment was to squirt it through a large bronze tube onto enemy ships. Usually the mixture would be stored in heated, pressurised barrels and projected through the tube by some sort of pump, operators being protected behind large iron shields. Byzantines used Greek Fire only rarely, apparently out of fear that the secret mixture might fall into enemy hands. The loss of the secret would be a greater loss to Byzantium then the loss of any single battle. In 678 the Byzantines utterly destroyed a Muslim fleet - over 30,000 men were lost. 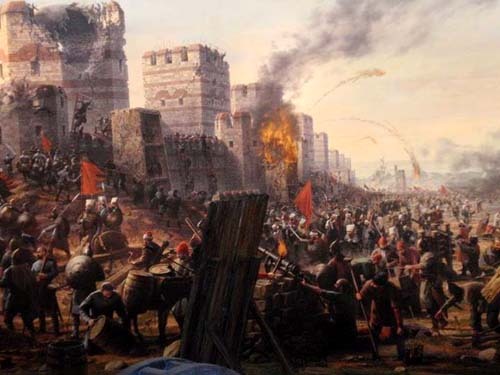 In 717-718 Caliph Suleiman attacked Constantinople (Byzantium). Most of the Muslim fleet was once again destroyed by Greek Fire, and the Caliph was forced to flee. There is virtually no documentation of its usage after this time by the Byzantines and it is generally believed that it was during this era that the secret of creating Greek Fire was lost. Formulae used after this date never seems to have had the same devastating effect. 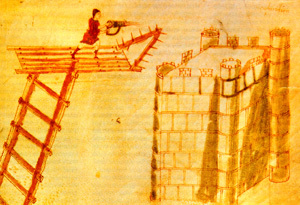 Some form of Greek Fire continued to be used for centuries. Byzantines used it against the Venetians during the Fourth Crusade. A so-called "carcass composition" containing sulphur, tallow, rosin, turpentine, saltpetre and antimony, became known to the Crusaders as Greek fire but is more correctly called wildfire. So far, no-one has been able to recreate Greek Fire. Arabian armies, who eventually created their own version sometime between the mid-seventh century and the early tenth. It was relatively weak copy of the original Byzantine substance, though still one of the most devastating weapons of the period. 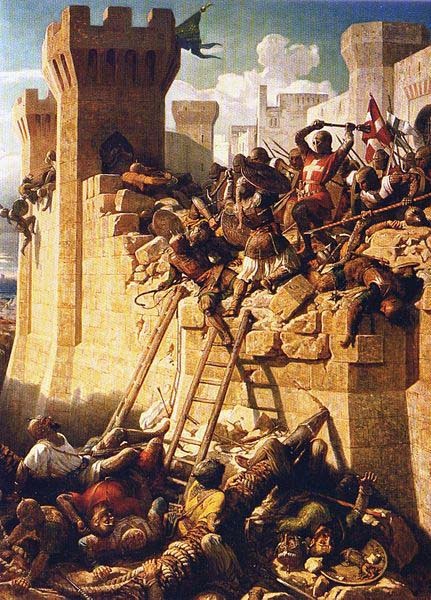 Arabs used the Greek Fire much like Byzantines, using brass tubes mounted aboard ships or on castle walls. They also filled jars with it, to be hurled by hand at their opponents. 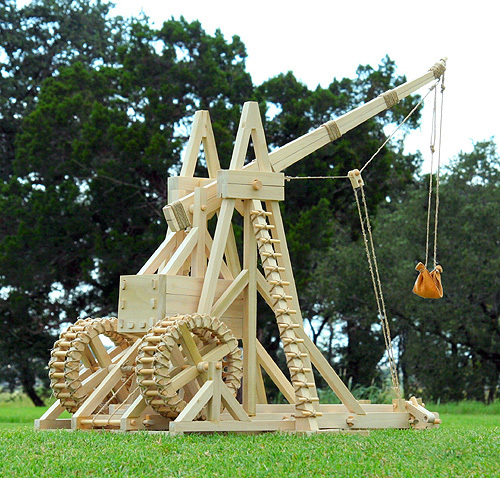 Arrows and javelins would be used to carry the mixture further and engines of war could be used to throw larger amounts over castle walls. As a defence, water alone was ineffective. On land sand could be used to stop the burning . Intriguingly it is also known that vinegar and urine were effective - suggesting an alkaline composition that could be neutralised by acid. According to some accounts pure or salt water served to intensify the burning, suggesting that Greek Fire may have been a 'thermite-like' reaction, perhaps involving quicklime. According to some sources, Greek Fire burst into flames on contact with water. Some have suggested phosphorus, Others have suggested a form of naphtha or another low-density liquid hydrocarbon (petroleum was already known in the East). There are numerous candidates including liquid petroleum, naphtha, burning pitch, sulphur, resin, quicklime and bitumen, along with a hypothetical unknown "secret ingredient". The exact composition is unlikely ever to be deduced from the inadequate surviving records. It is not clear from contemporary reports if the operator ignited the mixture with a flame as it emerged from the syringe, or if it ignited spontaneously on contact with water or air. If the latter is the case, it is possible that the active ingredient was calcium phosphide, made by heating lime, bones, and charcoal. On contact with water, calcium phosphide releases phosphine, which ignites spontaneously. The reaction of quicklime with water also creates enough heat to ignite hydrocarbons, especially if an oxidiser such as saltpetre is present. Ingredients were apparently preheated in a cauldron, and then pumped through a pump or used in hand grenades. If a pyrophoric reaction was involved, perhaps these grenades contained chambers for the fluids, which mixed and ignited when the vessel broke on impact with the target. Professor J.R. Partington, A History of the Greek Fire and Gunpowder, Heffer, 1960. Greek fire was not the only Chemical Weapon. Poisoned arrows could be employed and in the late medieval period gunpowder became common. Medieval warriors also used basic biological weapons, for example catapulting dead and diseased animals into a defended fortress to help spread disease. Ancient armies had used sophisticated psychological weapons. For example would have mad armour suitable for a man of several times normal size. He would then leave a few samples laying around the scene of his victories against the Persians. After he had gone Persians would find this armour and were were soon spreading stories of Alexander's superhuman giant soldiers. Christendom did not stretch to this level of sophistication, but it did engage in some psychological warfare, spreading rumours for example, sometimes with success effectively turning a military defeat into a political victory. Other examples of psychological warfare include making loud noises (an old Celtic practice) and catapulting the severed heads of captured enemies back into the enemy camp. Defenders in castles under siege might prop up dummies beside the walls to make it look like there were more defenders than there really were. 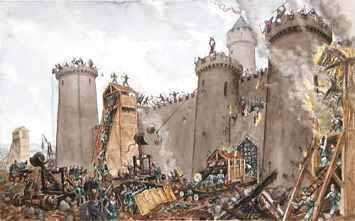 They might throw food from the walls to show besiegers that provisions were plentiful (Dame Carcas, who saw off the Franks, supposedly gave her name to Carcassonne after feeding the last few scraps of food in the besieged city to the last pig and then tossing over the walls as a present to the Franks. As intended, they deduced that their siege was useless and raised it the next day). Firearms provided a strong psychological benefit when they were introduced, even though their rate of fire rendered them almost useless - and their users often blew themselves up rather than the enemy - literally hoist by their own petard. [The Byzantine Emperor Alexios] had fixed to the bows of each of his galleys a tube ending in the head of a lion or other beast wrought in brass or iron, 'so that the animals might seem to vomit flames'. The fleet came up with the Pisans between Rhodes and Patara, but as its vessels were pursuing them with too great zeal it could not attack as a single body. The first to reach the enemy was the Byzantine admiral Landulph, who shot off his fire too hastily, missed his mark and accomplished nothing. But Count Eleemon, who was the next to close, had better fortune; he rammed the stern of a Pisan vessel, so that the bows of his ship got stuck in its steering-oar tackle. Then, shooting forth the fire, he set it ablaze, after which he pushed off and successfully discharged his tube into three other vessels, all of which were soon in flames. The Pisans then fled in disorder, 'having had no previous knowledge of the device, and wondering that fire, which usually burns upwards, could be directed downwards or to either hand, at the will of the engineer who discharged it'. That the Greek fire was a liquid, and not merely an inflammable substance attached to ordinary missiles, after the manner of fire-arrows, is quite clear from the fact that Leo [VI the Wise] proposes to cast it on the enemy in fragile earthen vessels which may break and allow the material to run aboutas also from the name pyr enygron or 'liquid fire' which Anna uses for it. C.W.C. Oman paraphrasing an account by Alexios's daughter Anna Comnena (10831153) about a sea battle between the Pisans and Byzantines near Rhodes in the year 1103. It happened one night, whilst we were keeping night-watch over the tortoise-towers, that they brought up against us an engine called a perronel (which they had not done before) and filled the sling of the engine with Greek fire. When that good knight, Lord Walter of Cureil, who was with me, saw this, he spoke to us as follows: "Sirs, we are in the greatest peril that we have ever yet been in. For, if they set fire to our turrets and shelters, we are lost and burnt; and if, again, we desert our defences which have been entrusted to us, we are disgraced; so none can deliver us from this peril save God alone. My opinion and advice therefor is: that every time they hurl the fire at us, we go down on our elbows and knees, and beseech Our Lord to save us from this danger. So soon as they flung the first shot, we went down on our elbows and knees, as he had instructed us; and their first shot passed between the two turrets, and lodged just in front of us, where they had been raising the dam. Our firemen were all ready to put out the fire; and the Saracens, not being able to aim straight at them, on account of the two penthouse wings which the King had made, shot straight up into the clouds, so that the fire-darts fell right on top of them. A"mine" was a tunnel dug to destabilise and bring down castles and other fortifications. The technique could be used only when the fortification was not built on solid rock. It was developed as a response to stone built castles that could not be burned like earlier-style wooden forts. A tunnel would be excavated under the outer defences either to provide access into the fortification or more often to collapse the walls. These tunnels were supported by temporary wooden props as the digging progressed, just as in any mine. Once the excavation was complete, the mine was filled with combustible material. When lit it would burn away the props leaving the structure above unsupported and liable to collapse. 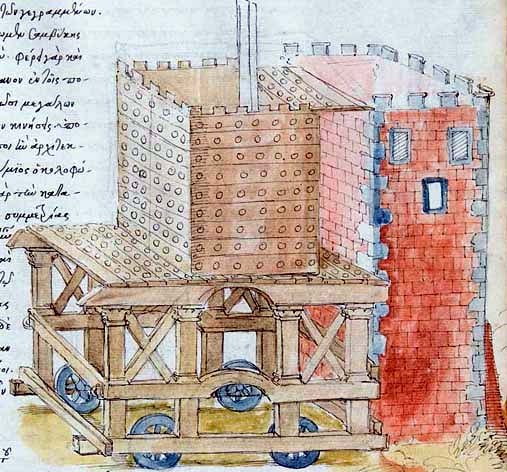 "... after the top of the wall had been somewhat weakened by bombardment from petraries, our engineers succeeded with great difficulty in bringing a four-wheeled wagon, covered in oxhides, close to the wall, from which they set to work to sap the wall" (Historia Albigensis - Pierre des Vaux de Cernay, 53). Successful sapping usually ended the battle since either the defenders would no longer be able to defend and surrender, or the attackers would simply charge in and engage the defenders in close combat. There were several methods to resist under mining. Often the siting of a castle would be such as to make mining difficult. 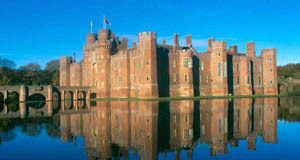 The walls of a castle could be constructed either on solid rock or water-logged land making it difficult to dig mines. A very deep ditch or moat could be constructed in front of the walls, or even an artificial. This makes it more difficult to dig a mine and even if a breach is made the ditch or moat makes exploiting the breach difficult. The defenders could also dig counter mines. From these they could then either dig into the attackers tunnels and sortie into them to either kill the sappers or to set fire to the pit-props to collapse the attackers' tunnel. Alternatively they could undermine the attackers' tunnel to collapse it. If the walls were breached they could either place obstacles in the breach for example a chevaux de frise to hinder an attack, or construct a coupure. The practice has left us reminders in English. "undermining" has acquired figurative as well as literal meanings. And military engineers are still known as Sappers. Water was essential to any army and the defence of any stronghold. Wherever practical castles were built on the site of natural springs but that was not always possible. Where it was not, much effort went into digging wells or aqueducts (sometimes subterranean), or massive cisterns. Many of the castles that fell during the Cathar Wars did so because of a shortage of water, including Termes and Carcassonne. 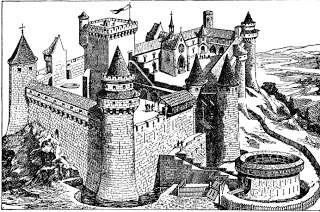 The illustration on the left shows a massive defensive structure built at Carcassonne to ensure a water supply and access to the River Aude. The usual method for solving logistical problems for smaller armies was foraging or "living off the land" - effectively stealing whatever was needed: animals, crops, wood and so on. The normal "campaign season" corresponded to the seasons of the year when there would be food on the ground and relatively good weather. This season was usually from spring to autumn. Soldiers were rarely full-time and often needed to attend to their own land at home. In many European countries peasants were obliged to perform around 45 days of military service per year without pay, usually during this campaign season when they were not required for agriculture. By early-spring all the crops would be planted, freeing the male population for warfare until they were needed for harvest time in late-autumn. Plunder in itself was often an objective of military campaigns, to either pay mercenary forces, seize resources, reduce the fighting capacity of enemy forces, or even just as a public insult to the enemy ruler. With the advent of castle-building and the extended siege, supply problems became much greater, as armies had to stay in one spot for months, or even years. 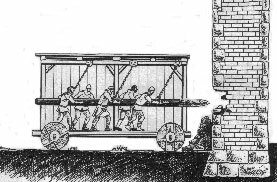 Supply trains are as much a feature of Medieval warfare as they are of ancient and modern warfare. Due to the impossibility of maintaining a real front in pre-modern warfare, supplies had to be carried with the army or transported to it while under guard. However, a supply source moving with the army was necessary for any large-scale army to operate. Medieval supply trains are often found in illuminations and even poems of the period. River and sea travel often provided the easiest way to transport supplies. During his invasion of the Levant, Richard I of England was forced to supply his army as it was marching through a barren desert. By marching his army along the shore, Richard was regularly re-supplied by ships travelling along the coast. Likewise, as in Roman Imperial times, armies would frequently follow rivers while their supplies were being carried by barges. Supplying armies by mass land-transport would not become practical until the invention of rail transport and the internal combustion engine. The baggage train provided an alternative supply method that was not dependent on access to a water-way. However, it was often a tactical liability. Supply chains forced armies to travel more slowly than a light skirmishing force and were typically centrally placed in the army, protected by the infantry and outriders. Attacks on an enemy's baggage when it was unprotected — as for instance the French attack on the English train at Agincourt, highlighted in the play Henry V—could cripple an army's ability to continue a campaign. This was particularly true in the case of sieges, when large amounts of supplies had to be provided for the besieging army. To refill its supply train, an army would forage extensively as well as re-supply itself in cities or supply points - border castles were frequently stocked with supplies for this purpose. A failure in logistics often resulted in famine and disease for a medieval army, with corresponding deaths and loss of morale. A besieging force could starve while waiting for the same to happen to the besieged, which meant the siege had to be lifted. 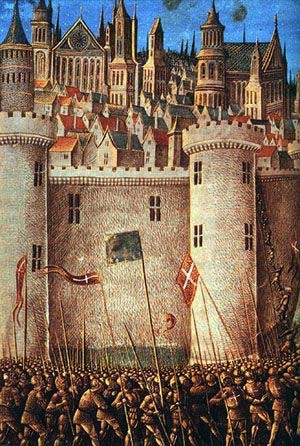 With the advent of the great castles of high medieval Europe however, this problem was typically something commanders prepared for on both sides, so sieges could be long, drawn-out affairs. 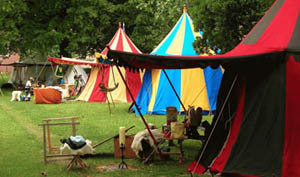 Epidemics of diseases such as smallpox, cholera, typhoid, and dysentery often swept through medieval armies, especially when poorly supplied or sedentary. In a famous example, in 1347 the bubonic plague erupted in the besieging Mongol army outside the walls of Caffa, Crimea where the disease then spread throughout Europe as the Black Death. For the inhabitants of a contested area, famine often followed protracted periods of warfare, because foraging armies ate any food stores they could find, reducing or depleting reserve stores. In addition, the overland routes taken by armies on the move could easily destroy a carefully planted field, preventing a crop the following season. Moreover, the death toll in war hit the farming labour pool particularly hard, making it even more difficult to recoup losses. The Spanish Reconquista (718-1492): In which the Moors were driven from the Iberian Peninsula; begun under Pelayo in Asturias, concluded under the Catholic Monarchs (Isabella I of Castile and Ferdinand II of Aragon), of Columbus fame. 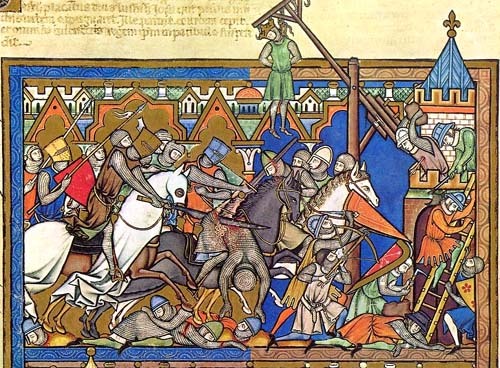 The Crusades (1096–1291): A generic, catch-all term for Church-sanctioned wars against non-Christians or heretics. Perhaps the most important technological advancement for medieval warfare in Europe was the invention of the stirrup, which had been unknown to the Romans. It most likely came to Europe with the Avars in the 600's AD, although it was not fully adopted by Europeans until the 900's AD. In the Medieval period, the mounted cavalry long held sway on the battlefield. Heavily armoured, mounted knights represented a formidable foe for peasant draftees and lightly-armoured freemen. 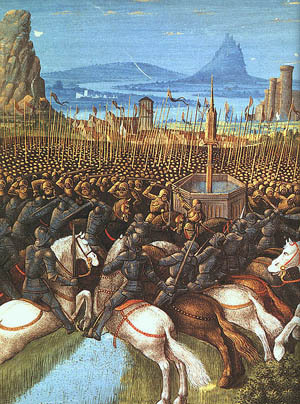 To defeat mounted cavalry, infantry used swarms of missiles or a tightly packed phalanx of men, techniques developed in Antiquity by the Greeks. 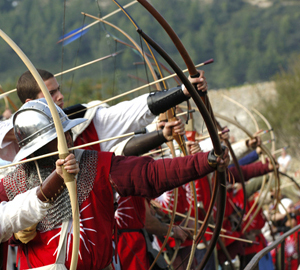 Ancient generals of Asia used regiments of archers to fend off mounted threats. Alexander the Great combined both methods in his clashes with swarming Asiatic horseman, screening the central infantry core with slingers, archers and javelin men, before unleashing his cavalry to see off attackers. 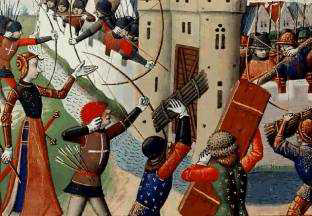 The use of long pikes and densely-packed foot troops was not uncommon in Medieval times. 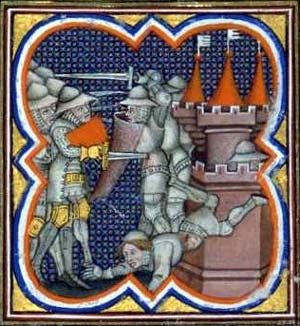 Flemish footmen at the Battle of the Golden Spurs met and overcame French knights in 1302, and the Scots held their own against heavily-armoured English invaders. 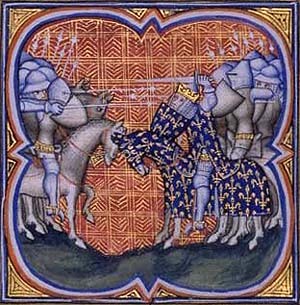 During the St. Louis' crusade, dismounted French knights formed a tight lance-and-shield phalanx to repel Egyptian cavalry. 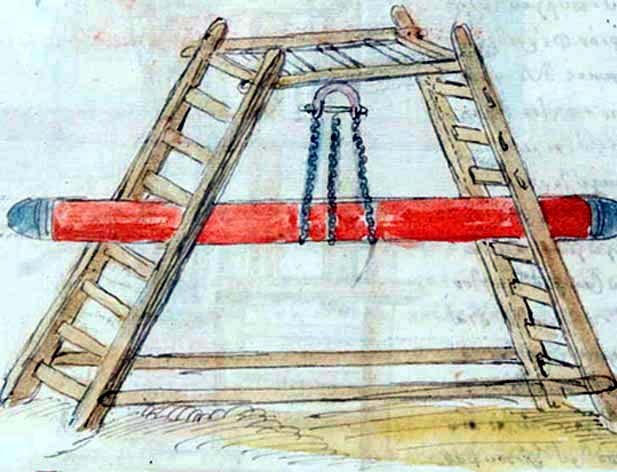 The Swiss used pike tactics in the late medieval period. While pikemen usually grouped together and awaited a mounted attack, the Swiss developed flexible formations and aggressive manoeuvring, forcing their opponents to respond. The Swiss won at Morgarten, Laupen, Sempach, Grandson and Murten, and between 1450 and 1550 every leading prince in Europe hired Swiss pikemen, or emulated their tactics and weapons. Welsh & English longbowman used a single-piece longbow to deliver arrows that could penetrate contemporary plate armour and mail. 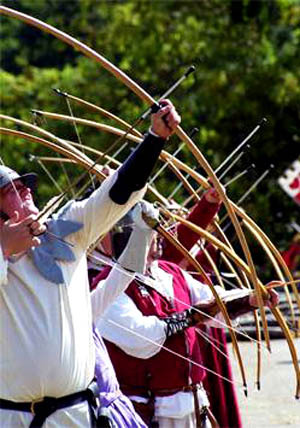 The longbow was a difficult weapon to master, requiring years of use and constant practice. A skilled longbowman could shoot about 12 shots per minute. This rate of fire was far superior to competing weapons like the crossbow or early gunpowder weapons. The nearest competitor to the longbow was the much more expensive crossbow, used often by urban militias and mercenary forces. 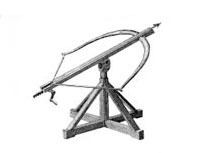 The crossbow had greater range and penetrating power, and did not require the extended years of training. At Crécy and Agincourt bowmen unleashed clouds of arrows into the ranks of knights. At Crécy, even 15,000 Genoese' crossbowmen could not dislodge them from their hill. At Agincourt, thousands of French knights were brought down by armour-piercing bodkin point arrows and horse-maiming broadheads. The Welsh longbowmen decimated an entire generation of the French nobility. Since the longbow was difficult to deploy in a thrusting mobile offensive, it was best used in a defensive configuration. Bowmen were extended in thin lines and protected and screened by pits (as at the Battle of Bannockburn), staves or trenches. The terrain was usually chosen to put the archers at an advantage forcing their opponents into a bottleneck (Agincourt) or a hard climb under fire (Crécy). 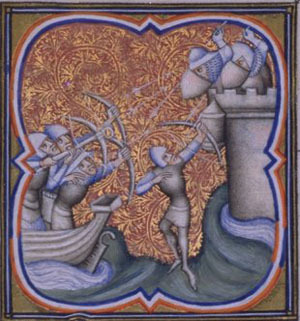 Sometimes bowmen were deployed in a shallow "W", enabling them to trap and enfilade their foes. The pike and the longbow put an end to the dominance of cavalry in European warfare, making the use of foot soldiers more important than they had been in recent years. Knights began themselves to rather fight dismounted, using two-handed swords, poleaxes and other polearms, as the improved knightly plate armour made them fairly immune to arrows. Gunpowder eventually was to provoke even more significant changes. However, a mounted reserve was often kept, and the heavy cavalry continued to be an important battlefield arm of European armies until the nineteenth century, when new and more accurate weapons made the mounted soldier too easy a target. In the armies of Europe, mounted and unmounted crossbowmen, often mixed with javeliners and archers, occupied a central position in battle formations. Usually they engaged the enemy in offensive skirmishes before an assault of mounted knights. Crossbowmen were also valuable in counterattacks to protect their infantry. The rank of commanding officer of the crossbowmen corps was one of the highest positions in any army of this time. Along with polearm weapons made from farming equipment, the crossbow was also a weapon of choice for insurgent peasants such as the Taborites. 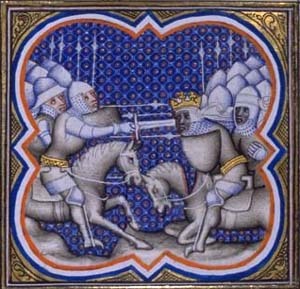 Mounted knights armed with lances proved ineffective against formations of pikemen combined with crossbowmen whose weapons could penetrate most knights' armor. 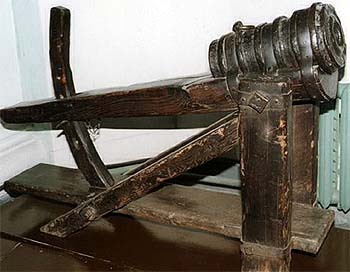 The invention of pushlever and ratchet drawing mechanisms enabled the use of crossbows on horseback, leading to the development of new cavalry tactics. Knights and mercenaries deployed in triangular formations, with the most heavily armoured knights at the front. Some of these riders would carry small, powerful all-metal crossbows of their own. 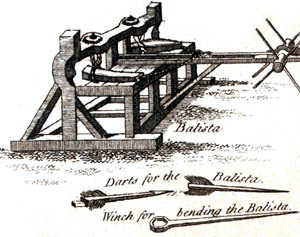 Crossbows were eventually replaced in warfare by more powerful gunpowder weapons, although early guns had slower rates of fire and much worse accuracy than contemporary crossbows. 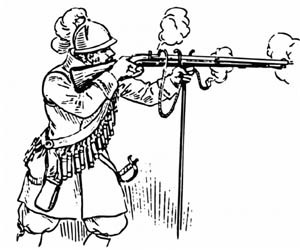 Later, similar competing tactics would feature arquebusiers or musketeers in formation with pikemen, pitted against cavalry firing pistols or carbines. 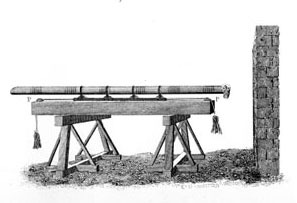 Cannons were introduced to the battlefield in the later medieval period. However, their very poor rate of fire (which often meant that only one shot was fired in the course of an entire battle) and their inaccuracy made them more of a psychological force multiplier than an effective anti-personnel weapon. 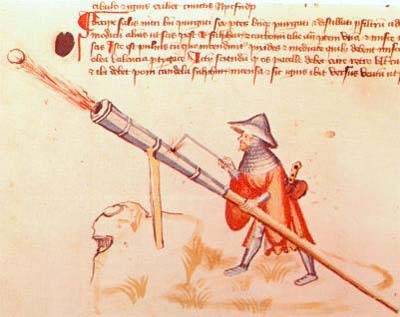 Later on in medieval warfare, one handed cannons were introduced, the rate of fire improved only slightly, but the cannons became far easier to aim, largely because they were smaller and much closer to their wielder. 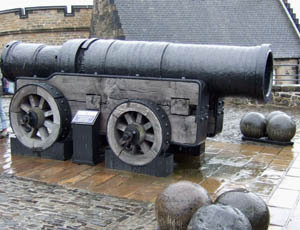 Users could be easily protected, because the cannons were lighter and could be moved far more quickly. Real field artillery did not become truly effective or commonly employed until well into the early modern period. The introduction of the arquebus is reflected in contemporary castle architecture - traditional arrow slits were replaced by (or adapted into gun ports). Battlefield communications before the advent of strict lines of communication were difficult. Communication was done through musical signals (drums and horns), audible commands, mounted messengers, and visual signals such as flags. 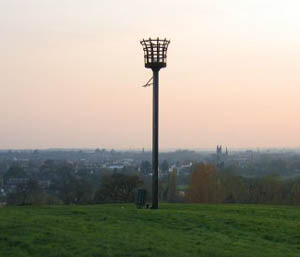 Fire beacons were used in many places where there was a network of towers or castles visible one from another. On the border between England and scotland a line of Peel Towers was built for exactly this purpose. In Scandinavia many hill forts were part of beacon networks to warn against invading pillagers. In Wales, the Brecon Beacons were named for beacons used to warn of approaching English raiders. In England, the most famous examples are the beacons used in Elizabethan England to warn of the approaching Spanish Armada. Many hills in England were named Beacon Hill after such beacons. In the Languedoc, where castles were often built on mountain tops, castles were almost invariably in view of at least one one other castle. Carrier pigeons historically carried messages only one way, to their home. They had to be transported manually before another flight. By placing their food at one location and their home at another location, pigeons have been trained to fly back and forth up to twice a day reliably. 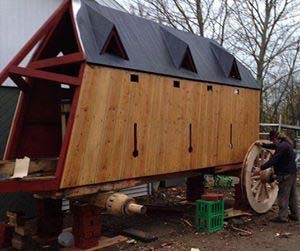 This setup allows Pigeons to cover 160 km round trip. 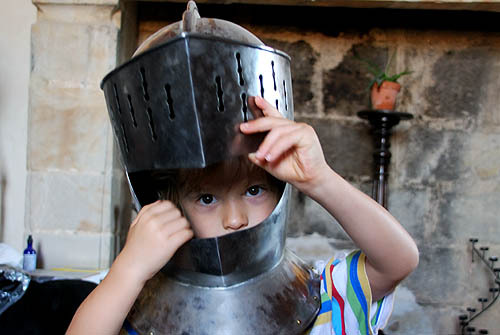 The medieval knight was usually mounted and armoured, often connected with nobility or royalty, although especially in north-eastern Europe knights could also come from the lower classes. The cost of a knight's armour, horses, and weapons was great. This helped transform the knight, at least in western Europe, into a distinct social class separate from other warriors. During the crusades, holy orders of monks who were also knights were created, including the Knights Templar, the Knights Hospitaller and the Teutonic Knights. They were formed to fight in the Holy Land and became the "storm troops" of the Christian crusaders. Heavy cavalry, armed with lances and an assortment of hand weapons, played a significant part in the battles of the Middle Ages. The heavy cavalry consisted of nobles and wealthy knights who could afford the equipment. Heavy cavalry made the difference between victory and defeat in many key battles. Their charges could break the lines of most infantry formations, making them a valuable asset to all medieval armies, the equivalent of twentieth century tank regiments. Light cavalry consisted of lighter armed and armoured men, who could have lances, javelins or missile weapons, such as bows or crossbows. Light cavalry were used as scouts, skirmishers or outflankers. Many countries developed their own styles of light cavalry, such as Hungarian mounted archers, Spanish jinetes, Italian and German mounted crossbowmen. Crusaders tended to favour heavy cavalry mounted on mares while the Saracens favoured light cavalry mounted on stallions. In the earliest Middle Ages it was the obligation of every noble to respond to the call to battle from his liege lord with his own equipment, archers, and infantry. This decentralized system was necessary due to the social order of the time, but could lead to motley forces with variable training, equipment and abilities. The more resources the noble had access to, the better his troops would typically be. Typically feudal armies consisted of a core of highly skilled knights and their household troops, mercenaries hired for the time of the campaign and feudal levies fulfilling their feudal obligations, who usually were little more than rabble. They could, however, be efficient in disadvantageous terrain. Towns and cities could also field militias. As central governments grew in power, a return to the citizen and mercenary armies of the classical period also began, as central levies of the peasantry began to be the central recruiting tool. It is often claimed that the best infantrymen came from the younger sons of free land-owning yeomen, such as the English archers and Swiss pikemen. England was one of the most centralized states in the Middle Ages, and the armies that fought the Hundred Years' War were mostly paid professionals. In theory, every Englishman had an obligation to serve for forty days. Forty days (called quarantine) was not long enough for a campaign, especially one on the continent. Scutage was introduced, under which most Englishmen paid to escape their service and this money was used to create a permanent army. Almost all high medieval armies in Europe were composed of a great deal of paid core troops, and there was a large mercenary market in Europe from the early twelfth century. As the Middle Ages progressed, both the Papacy and Italian cities began to rely mostly on mercenaries to do their fighting rather than the militias that had dominated the early and high medieval period in this region. These would be groups of career soldiers who would be paid a set rate. Mercenaries tended to be effective soldiers, especially in combination with standing forces. In Italy they came to dominate the armies of the city states. While at war they were considerably more reliable than a standing army, but in peacetime they proved a risk to the state itself (as the Pretorian Guard had once been in Roman times). Mercenary-on-mercenary warfare in Italy led to relatively bloodless campaigns which relied as much on manoeuvre as on battles, since the condottieri recognized it was more efficient to attack the enemy's ability to wage war rather than his battle forces,, and attempting to attack the enemy supply lines, his economy and his ability to wage war rather than risking an open battle, and manoeuvre him in a position where risking a battle would have been suicidal. Knights were drawn to battle by feudal and social obligation, but also by the prospect of profit and advancement. 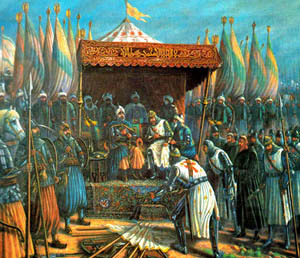 Those who performed well stood to increase their landholdings and advance in the social hierarchy - this was a major factor in the Crusades in the Holy Land and also European crusades such as the Albigensian Crusade - the War against the Cathars of the Languedoc. For the mounted knight Medieval Warfare could be a relatively low risk affair. Nobles avoided killing each other, rather preferring capturing them alive, for several reasons for one, many were related to each other, had fought alongside one another, and they were all members of the same elite culture; for another, a noble's ransom could be very high, and indeed some made a living by capturing and ransoming nobles in battle. Huge ransoms could be demanded for captured knights and more still for high nobles and kings. Some knights made their fortunes by fighting. William the Marshall being the best known example. Even peasants, who did not share the bonds of kinship and culture, would often avoid killing a nobleman, valuing the high ransom that a live capture could bring, as well as the valuable horse, armour and equipment that came with him. On the other hand it was quite common, even at the height of "chivalric" warfare, for the knights to suffer heavy casualties during battles. 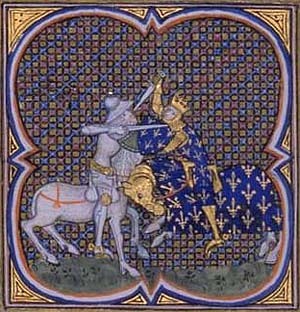 Christendom was shaken when King Peter II of Aragon was killed fighting on the side of his vassal Raymond of Toulouse at Muret in the Languedoc. Clergymen played a major part in battles - from their planning to building siege engines (a clerical specialty), encouraging the troops and taking part in the fighting. 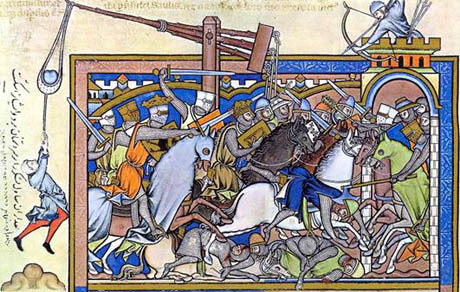 We have many accounts of senior clergy leading battles and not only during the crusades. 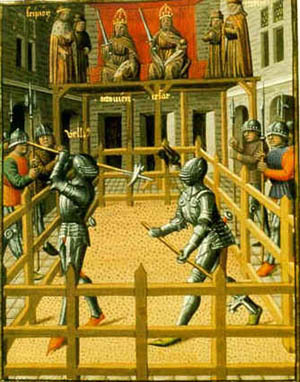 They are also depicted in contemporary art - popes, cardinals and bishops, wearing full armour and wielding weapons. The role of military bishops is commemorated today by the presence of four bishops on a chess board. Clerical combatants are depicted in medieval art and according to tradition favoured the mace as a weapon (a mace could kill without shedding blood which the Church considered desirable). 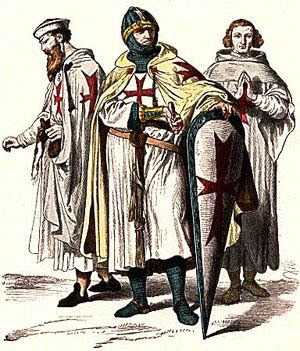 Knights Templar and Knights Hospitaller, the shock troops of Christian armies, were monks in the fullest sense- they took the same vows as other monks in addition to their vows as knights. If caught by the enemy they were almost always executed while other knights were usually ransomed. The reason was that they were such fanatical fighters that it made sense to put them permanently out of the war whenever possible. 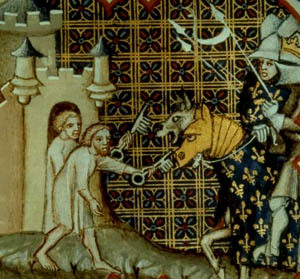 The practice of carrying relics into battle is a feature that distinguishes medieval warfare from its predecessors or from early modern warfare. The presence of relics was believed to be an important source of supernatural power that served both as a spiritual weapon and a form of defence; the relics of martyrs were considered by Saint John Chrysostom much more powerful than "walls, trenches, weapons and hosts of soldiers" - another reason for so many lost battles. 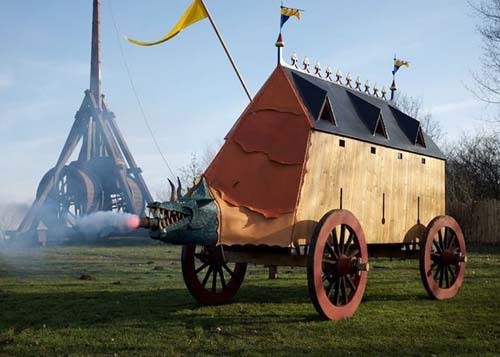 In Italy, the carroccio or carro della guerra, the "war wagon" , was an elaboration of this practice that developed during the 13th century. 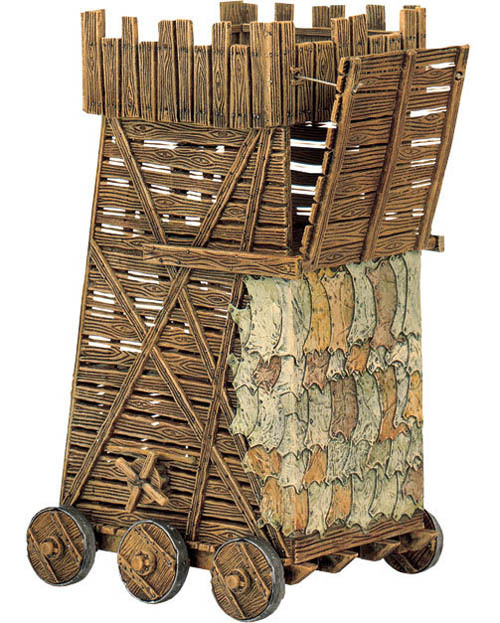 A Carroccio was a four-wheeled war altar drawn by oxen, used by the medieval republics of Italy. It was a rectangular platform on which the standard of the city and an altar were erected. Priests held services on the altar before the battle, and the trumpeters beside them encouraged the fighters to the fray. 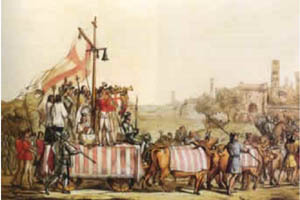 The carro della guerra of Milan was draped in scarlet cloth and drawn by three yoke of oxen caparisoned in white with the red cross of Saint George, the city's patron, it carried a crucifix so massive it took four men to step it in place, like a ship's mast. The Prince Bishop of Durham displayed (and still displays) his bishop's mitre within a ducal coronet, reflecting his temporal power. Behind the shield are a crozier and a sword. Contrary to popular belief, women often engaged in medieval warfare. If the Chatelaine happened to be at home while their husband was away and their castle was besieged, it was routine for her to command the defences. 8th century: Shieldmaidens fight at the Battle of Bråvalla on the side of the Danes. 722: Queen Aethelburg of Wessex destroys the town of Taunton. 750: Veborg, as well as many other Shieldmaidens, participate in the Battle of Bråvalla in Sweden. 783: Saxon women throw themselves barebreasted into battle against Charlemagne's forces. Among them is Fastrada, who became Charlemagne's fourth wife. Early 9th century: Cwenthryth fights Wulfred, Archbishop of Canterbury, for control of her abbey estates. 912-922: Reign of Ethelfleda, ruler of Mercia. She commanded armies, fortified towns, and defeated the Danes. She also defeated the Welsh and forced them to pay tribute to her. Mid 10th century: Queen Thyra of Denmark leads an army against the Germans. 971: The Scandinavian ruler of Kiev attacked the Byzantines in Bulgaria in 971. When the Norsemen had been defeated, the victors discovered shieldmaidens among the fallen warriors. Early 11th century: Freydís Eiríksdóttir, a Viking woman, sails to Vinland with Thorfinn Karlsefni. When she faced hostile natives while pregnant, she exposed her breasts and beat her chest with a sword. This caused the natives to run away. 1040-1090: Sichelgaita of Salerno second wife of Robert Guiscard, Duke of Apulia, accompanies her husband on military campaigns, and regularly puts on full armor and rides into battle at his side. At the Battle of Dyrrhachium (1081) she rallied Robert's troops when they were initially repulsed by the Byzantine army. 1046-1115: Lifetime of Matilda of Tuscany, the principal Italian supporter of Pope Gregory VII during the Investiture Controversy.. She is sometimes called la Gran Contessa ("the Great Countess") or Matilda of Canossa after her ancestral castle of Canossa. 1071: Richilde, Countess of Mons and Hainaut is captured fighting in the Battle of Cassel. 1072: Urraca of Zamora, Infanta of Castile, defends the city of Zamora against her brother, Sancho II of Castile. 1075: Emma de Guader, Countess of Norfolk defends Norwich castle while it is under siege. 1090: A Norman woman Isabel of Conches rides armed as a knight. 1121:Urraca of Castile fights her half-sister, Theresa, Countess of Portugal when she refuses to surrender the city of Tuy. 1131-1160: Melisende of Jerusalem ruler of the crusader Kingdom of Jerusalem is one of the rulers involved in the Second Crusade. 1136: Welsh princess Gwenllian ferch Gruffydd leads an army against the Normans. She is defeated and killed. 1141: Matilda of Boulogne raises an army to continue the fight for the crown of England, after her husband, King Stephen is captured by the Empress Matilda. 1145: Eleanor of Aquitaine accompanies her husband on the Second Crusade. 1172: Alrude Countess of Bertinoro ends a siege of Aucona by leading an army into battle and crushing imperial troops. Late 12th century: Eva MacMurrough conducts battles on behalf of her husband, the Earl of Pembroke. Mid 13th century: Eleanor of Castile accompanies her husband on his crusade. According to legend, she saves his life by sucking poison from his wound when he was injured. 1264: Eleanor of Provence raises troops in France for her husband during the Baron's War. 1271: Isabella of Aragon dies at Consenza on the way back from the Crusades. 14th century: Jane, Countess of Montfort leads troops into battle. 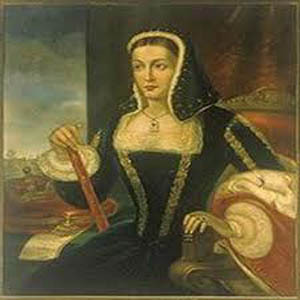 Countess Jeanne de Penthievre is among her antagonists. 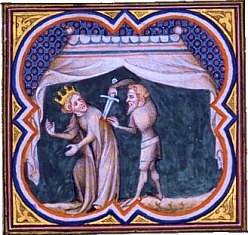 1326: Isabella of France invades England with Roger de Mortimer, and overthrows Edward II, replacing him with her son Edward III, with her and de Mortimer acting as regents. 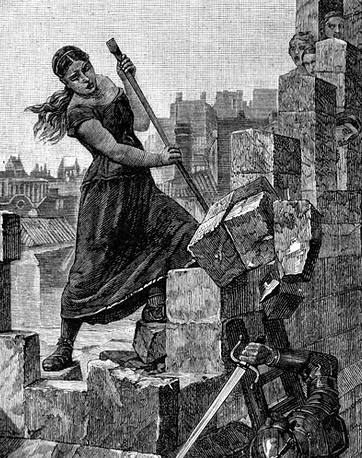 1334: Agnes Dunbar successfully defends her castle against a siege by the Earl of Salisbury. 1335: The Scots defeat a company led by the Count of Namur. 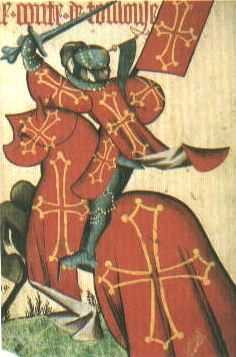 Amongst the Count's casualties was a female lancer who had killed her opponent, Richard Shaw, at the same moment that he had killed her. Her gender was only discovered when the bodies were being stripped of their armour at the end of the engagement. "The chronicler Bower seems to have been at least as impressed by the rarity of two mounted soldiers simultaneously transfixing one another with their lances as with the fact that one of them was a woman." 1364-1405: Tamerlane uses female archers to defend baggage trains. 1383: Eleanor of Arborea, ruler of Sardinia, conducts a defensive war against Aragon. 15th century: Maire o Ciaragain leads Irish clans in rebellion. 15th century: Isabella, Duchess of Lorraine, leads an army to rescue her husband from the Duke of Burgundy. 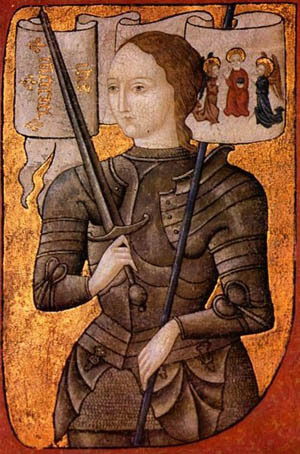 1429: Joan of Arc leads the French army. Yolande of Aragon supports her. Pierronne, a contemporary of hers, also hears voices and fights for the king of France. 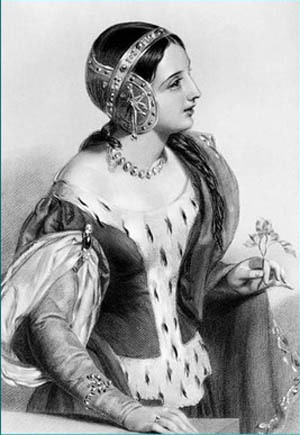 1461: Queen Margaret of Anjou defeats the Earl of Warwick in the Wars of the Roses. 1471: Queen Margaret of Anjou is defeated in battle at Tewksbury. 1472: Onorata Rodiana from Cremona, Italy is mortally wounded in battle. She had disguised herself as a man to become a soldier. Fall of Acre, the Crusaders' last stronghold in the Holy Land, in 1291. 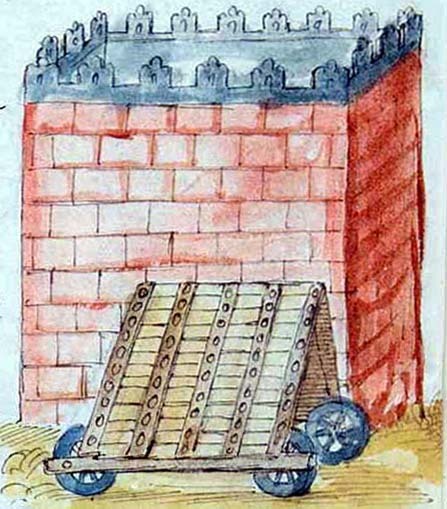 A siege using early cannon to fire stone balls to destroy the top of the castle walls. Here, the defenders have used barrels filled with stones as a temporary repair to their defences. Medieval pictures represent contemporary fashions and weaponry - not those approriate to the period represented. presumably to get near to the walls. This is a French illustration so bolsters the role of the French King. As a military commander Philippe was in reality several leagues below Richard. with a ram at the bottom, draw bridges all the way up, and crenallations at the top. 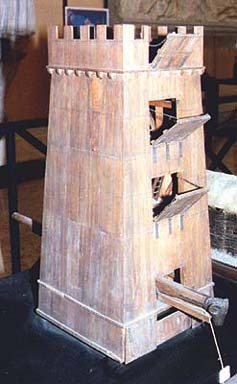 Another belfry - showing how the skins of freshly slaughtered animals were used to protect against fire. 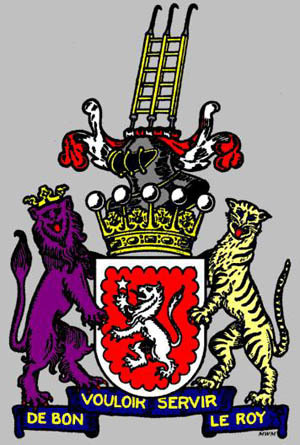 A siege ladder features in the crest of the arms of Grey. A Tortoise (under which miners would undermine walls). This castle has a walk-way giving access to an external water supply. The style is similar to the one at Carcassonne. Joan of Arc at the siege of Orleans. A collection of translations of primary source material, articles and reviews on the period. An educational site about living and working in eleventh to fourteenth century England, produced by high school students. 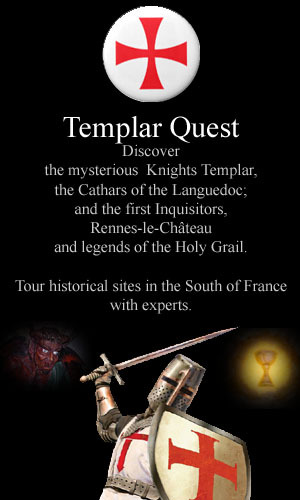 Comprehensive coverage of the history, culture and heritage of the Normans in France, the British Isles and Italy. Includes biographies, genealogies of rulers, a gazetteer of Norman buildings, places to visit and bibliographies. Medieval attitudes to the end of the previous millennium and argues for an apocalyptic viewpoint, Center for Millennial Studies. Selection of articles from the Journal of the Society of Archer-Antiquaries. An academic association examining medieval warfare and military history. Features information on the society as well as original articles and book reviews. « Bataille entre les Francs, commandés par le roi Clotaire II, et les Saxons ». Grandes Chroniques de France de Charles V. France, Paris, XIVème siècle. 65 x 65 mm. Bibliothèque nationale de France. Massacre de Sarrasins. Grandes Chroniques de France, Paris, XIVe s. Bibliothèque Nationale de France. 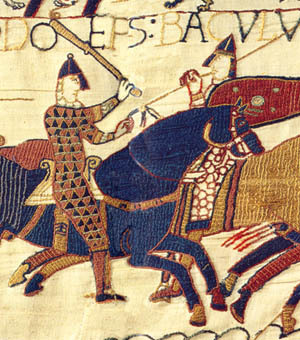 « Combat singulier entre le roi Clotaire II et Bertoald ». Grandes Chroniques de France de Charles V. France, Paris, XIVème siècle. 65 x 65 mm. Bibliothèque nationale de France. Assassinat de sigebert Ier. Grandes Chroniques de France vers 1375-1380. Bibliothèque Nationale de France, Paris.